How do I write Bengali in Photoshop and Illustrator? I have installed Avro but still not working. 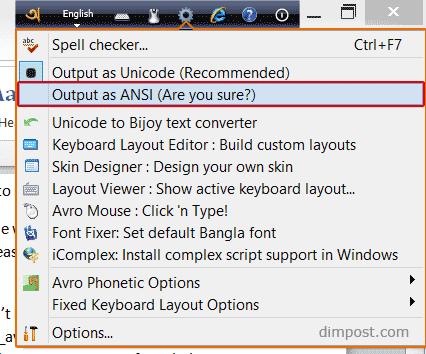 I write Bangla using Avro-keyboard. But it is not working in Photoshop. Bengali “ি”, “ী” is going broken. How can I solve this? These two unsolved question came to me from social friend; this is why I writing this tutorial. 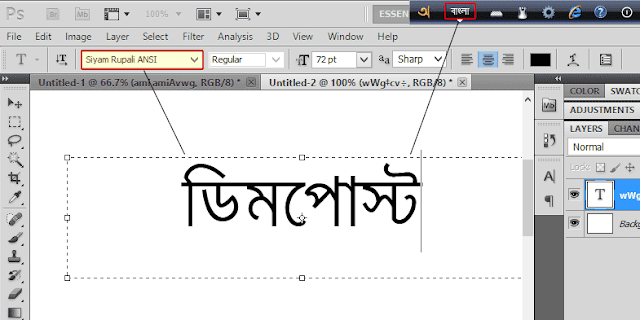 There is some other ways to do but in this tutorial I will show only one ways to writing Bengali in Photoshop using Avro. It is permanent, offline and most convenient easy ways to write Bengali on Photoshop, Illustrator etc. software. 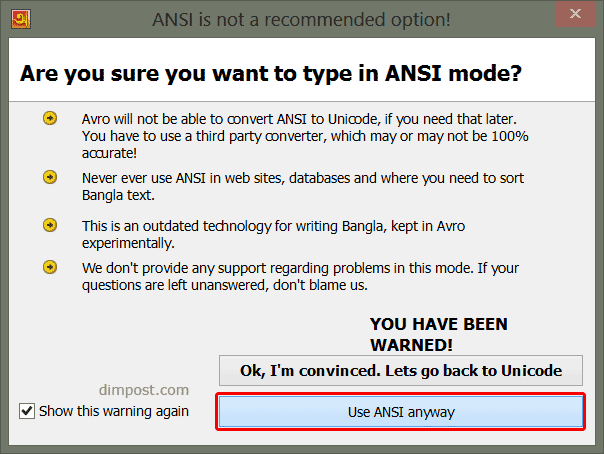 If you don’t have already installed Avro then download from here (11.8Mb) or here, and install it. Restart your PC if needed. And make sure all marked things are set as like in the screenshot below. Note: ANSI font is not suitable for web use. Use UNICODE font to writing Bengali on web. If you face any problem don’t hesitate to tell us. If you have seen any other better example or have an idea about this; let us know in comments, we would like to hear from you. hm well written, ami 2011 te erokom ekta post likhechilam link. BTW bijoy theke unicode e convert er jonno kun system use koren ??? Brother if i copy bangla writing and paste it in photoshop in doesnt show the font properly. But it ms word it comes out fine. I am not talking about writing but copying and pasting. What do you think is wrong? Mac a kivabe likhbo ? Ankur diye ki lekha jay ? its not working ..i have followed the path you have given but it is showing always "????" Which operating system are you using ? That path [C:\Windows\Fonts] is just an example, for different OS/ 'OS version' the path could be different. I test that in windows 8, Its working fine. Anek dhanyobad apnake.Photoshop e bangla likhar jonyo anek chestha korechhilam...kintu safal hoi ni. Apnar help peye ami ekhon khub sahajei bangla likhte parchhi. Will this work for Adobe Lightroom also?